Be sure you choose the best digestive enzyme supplement, using CL's results and ratings! How do you choose the digestive enzyme supplement that is best for you? It's not easy -- they contain a variety of enzymes and the labels often don't tell how much enzyme activity you can expect. 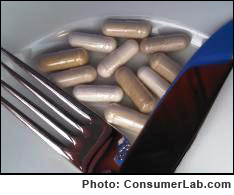 To help you, ConsumerLab.com purchased, tested, reviewed, and compared digestive enzyme supplements. We found that some labels are inaccurate. We also found that many products contain what they claim, but some are better for digesting fats, others for proteins, and others for carbohydrates or other parts of your food. (4/29/15): A CL member complained to a supplement maker that its digestive enzyme supplement was "Not Approved" in this report. We've posted the response from the company and we point out that the company remains incorrect in how it labels the enzyme activity of the product. For details, see the "Update" near the top of the full report.